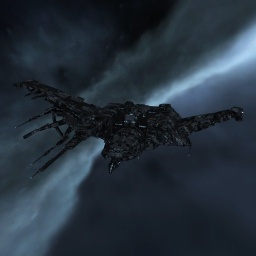 The Navy Issue Raven represents the best the Caldari have to offer on the battlefield: an all-out assault vessel with tremendous electronic warfare capabilities. Commissioned by Caldari Navy Special Operations Command in YC 104 in response to a campaign of coordinated Gurista attacks which threatened to decimate the populations of several planets in the Obe system, this hefty warship has since proven its worth many times over. The Raven Navy Issue (commonly abbreviated RNI, and sometimes CNR) is a logical progression from the standard Raven, with more fitting, better capacitor and better base tank. The Navy Raven loses the Raven's rate of fire bonus but makes up for it with two additional launcher slots, giving it a 33% DPS boost to the Raven's (up to) 25% boost. The Navy Raven also gains an explosion radius bonus, meaning it will do more damage to smaller targets. The Navy Scorpion and Navy Raven are similar ships and are often compared. The Navy Scorpion has a stronger tank and is easier to fit, while the Navy Raven has a longer range and does more damage to smaller targets due to its explosion radius bonus. Caldari Battleship to at least IV to take advantage of the range buff and increased damage to smaller targets that comes with every extra level in the skill. The usual L4 mission fit uses Cruise Missiles; train to IV and use Arbalest (Meta 4) or Caldari Navy (Faction) Cruise Missile Launchers. T2 launchers and ammo require Cruise Missiles V and Cruise Missile Specialization, a half-month train that isn't really useful outside of missioning battleships. However, if you plan on a career as a Raven L4 missioner, it's worth it for the productivity gain. Torpedos are not typically used as they only offer a slight (<10%) paper DPS gain for a quite severe range and application penalty. Along with the requisite Engineering and Electronic Systems skills required for adequately fitting most ships, Weapon Upgrades and Advanced Weapon Upgrades should be trained to V and IV respectively to help alleviate fitting problems. Guided Missile Precision and Target Navigation Prediction to at least IV to combat smaller targets. Target Painting should be trained to IV to gain access to the Signature Focusing skill. Drones V, Light Drone Operation V, Medium Drone Operation V, Drone Interfacing IV and Gallente Drone Specialization I/Minmatar Drone Specialization I are all are important for getting as much DPS out of the drone bay as possible. Train Tactical Shield Manipulation to IV. Shield Operation and Shield Management should be trained to V to improve shield capacity and recharge rate. Your tactics for L4 missions are largely the same as for a plain Raven: use your light scout drones on frigates and cruise missiles on everything else; and you've got an active shield tank, so use your booster to keep your shield in the 33-40% range. There is one major tactical change from a Raven: you are now flying a ship worth five to ten times as much. That means you need to be aware of potential gankers. You can write additional notes for Raven Navy Issue here. This page was last modified on 25 March 2018, at 01:02.